Missing People provides support to families who have been left behind. But just as importantly, we are a lifeline to anybody who is away from home as well. 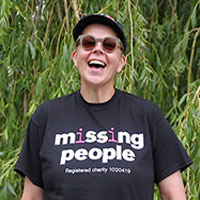 Ju Blencowe reflects in a beautiful post, on the on her time as a missing person on her missing anniversary. Its approaching the twelve month anniversary of the time I was missing. It would be the easiest thing to quietly let it pass by and there will be private moments of reflection and thankfulness but I can’t roll up such a significant life event and pack it away in an old trunk somewhere like some dark, dirty secret. That wouldn’t have the potential to reassure, empower, comfort people who may be walking that thin line themselves today and it wouldn’t be helping to dispel the myths around missing experiences either. ‘Keeping Faith’ aired recently on BBC Wales with the amazing actor Eve Myles was such a compelling roller coaster of emotion and deviation and it was also in the minutiae where the heart rending despair cut through; the holding and smelling of a loved ones garment, the rocking in the shower, the guttural cries, the repetition of listening to one last voicemail…….genius. It is art forms like this, alongside the narrative that we as survivors can offer that can change perspectives. There is shame and stigma and stereotypical responses to many aspects of mental health crisis and vulnerability, ironically I spent a large part of my life teaching anti oppressive, anti discriminatory practice to people in professions at the sharp end of supporting people through those times and many of those passions and commitments and drivers were borne out of my own struggles and lived experiences, nothing is ever wasted. After the death of my Dad as a young woman I moved away from my original life as a musician and painter to train as a social worker and now I find myself back with my first love, not just to create for its own sake but to weave those life experiences into genres and shapes that can be shared and heard and seen and read. Looking back I can hardly believe that I survived for so long on adrenaline alone trying to prove to those who told me as a child that I would never succeed at anything. How many others live life in the shadows of their own dreams and aspirations because someone, somewhere dared to rob them of those possibilities. I pushed and strived and despite leaving school way too early and being buffeted from service to service I remember the day when the tables turned and I thought “I’ll prove that I can”. Five degrees and a senior lecturers post later I found myself rattling around a cage of my own making where the creative elements were stifled and long gone and the bureaucratic tethering just a beast of a burden where I didn’t even recognise my own face anymore. You see, I went missing years ago, being missing was the beginning of finding myself again. I simply had a broken heart and it got fixed through the love of others. I am fortunate, I came home, I got well, I processed my grief, recovered from the ‘burn out’ and I am here to tell the story thanks to the love of my beautiful wife, close friends and the charity Missing People. Life is rich and hopeful and real and what once seemed like an endless experience of loss has been restored to a daily embracing of second chances. It’s not something I take for granted but it’s a life that leaves me feeling for those who are struggling and joining with those who are standing up to be counted. I have always been a staunch advocate for people without a voice and I admire those who are willing to show their vulnerability in order to stand in solidarity with those who cannot. When it becomes the norm to talk openly and honestly about mental ill health without fear of being judged, deselected, discredited or rejected, that’s true empathy and there are so very many of us striving for that status of equity and civility, acceptance and acknowledgment that we have so much to contribute to this rich life.